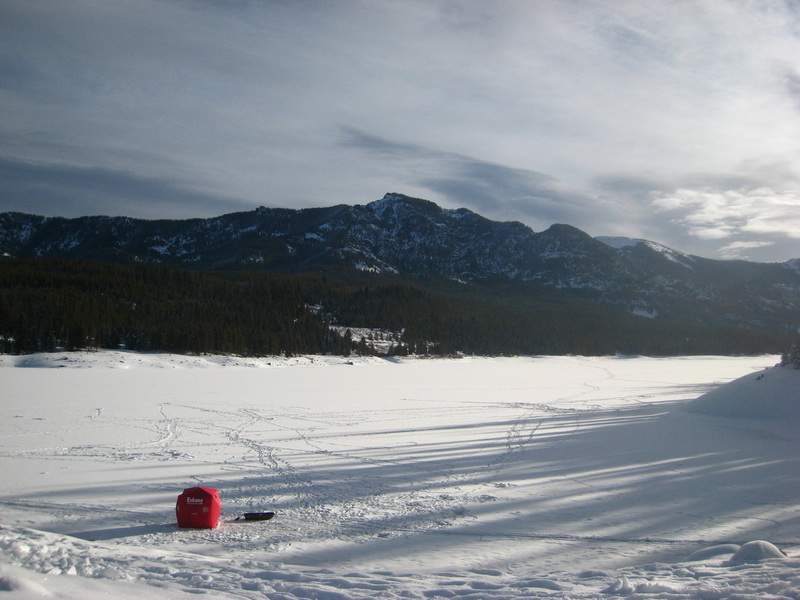 Below are various photos and descriptions of my ventures cragging around Montana. Note that everything on this page has short approaches and doesn't require a full day to do, and therefore don't have their own pages. 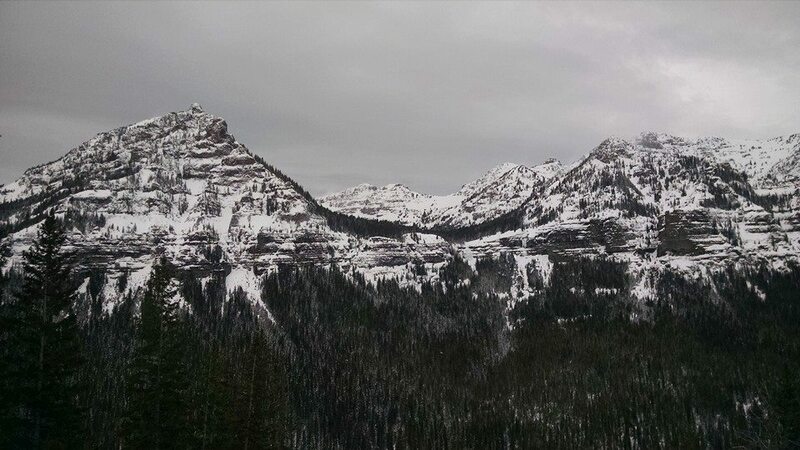 This was my first trip up Hyalite shortly after I moved to Bozeman. 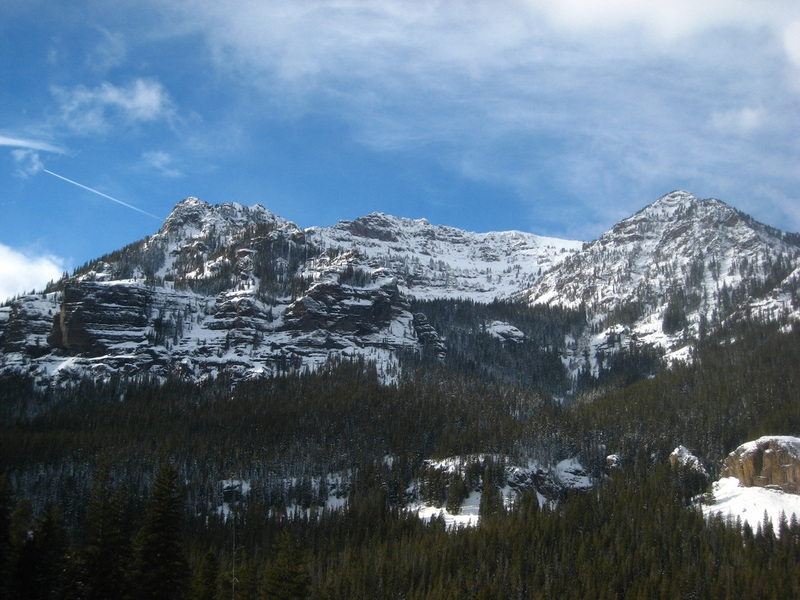 About a half-mile up the Hyalite Creek trail there is a talus slope on the right side with two short ice flows coming down from the cliffs above. The wide one is Fat Chance (WI 3) and just to the right is a thinner, steeper flow called Thin Chance (WI 4). Hannah and I did them in a short afternoon. 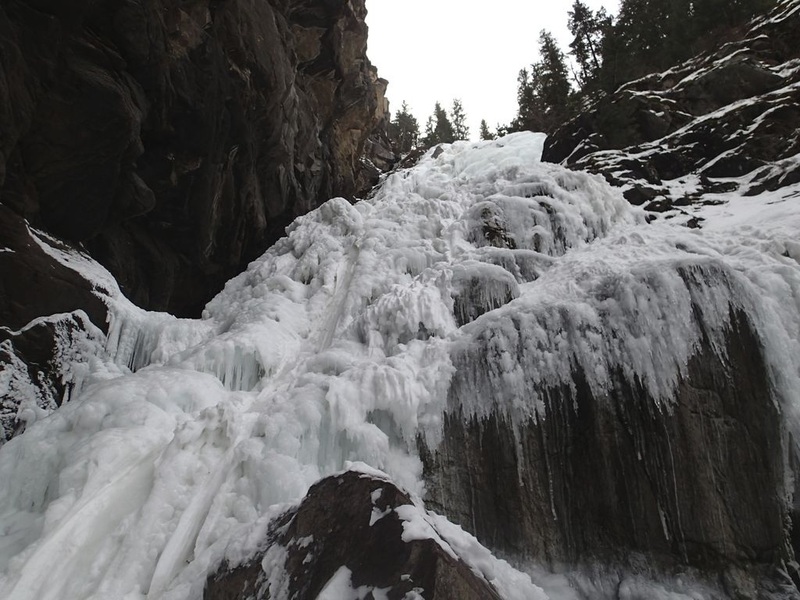 Ken and I went out to climb The Dribbles (WI 4) which is a three pitch flow about a mile further up the Hyalite Canyon of the famous Winter Dance, and a total of roughly two miles up canyon from the trailhead. 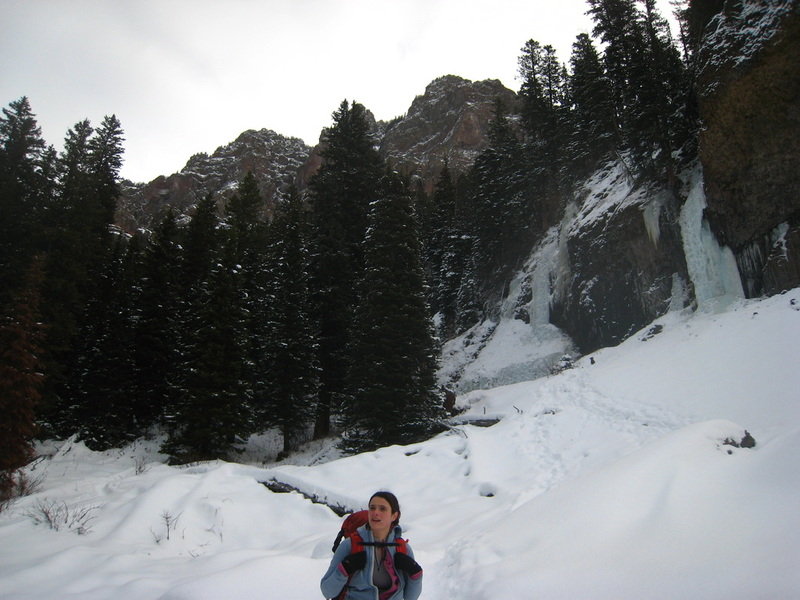 Unfortunately, we left the trail way too soon, and began climbing up right towards the base of Winter Dance. 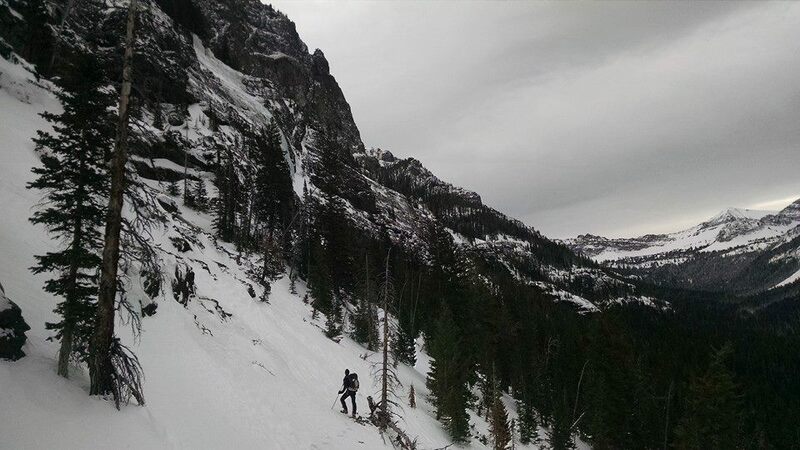 We realize our mistake after we are all the way to the base of the cliffs and then proceed to side-hill traverse up the canyon plowing our own path for nearly a mile before finally reaching the base of the route. 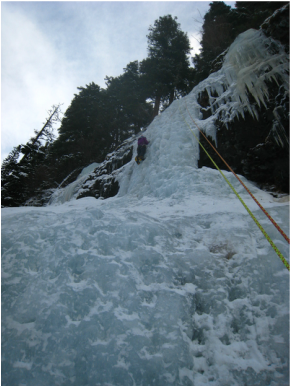 I led the first pitch, which was a full 60 meters up three small but steep ice steps. 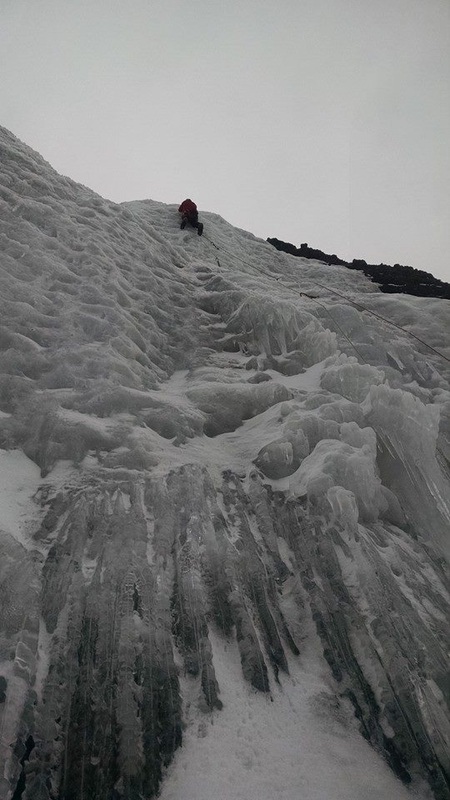 The second pitch was about 45 meters long and offered the most sustained WI 4 ice which Ken did a great job leading. The ice up to this point was excellent. I led the short third pitch which was nothing more than snice. I reached the anchor tree and Ken lowered me to the anchor and then followed. Two double rope rappels took us to the top of the first pitch which we were able to walk around to skiers right back to the base. From there we ran straight down the gully and met with the trail for an easy hike out. 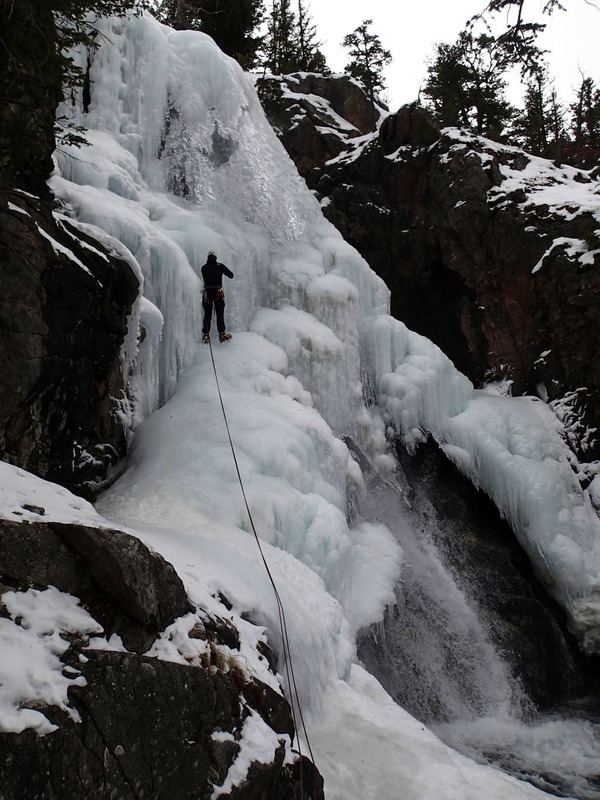 Jacob and I made a 5 day trip to Red Lodge to climb various ice routes and this was the first route we did. This flow has one of the shortest approaches and easily accessible all winter due to the road to the Stillwater Mine being plowed. 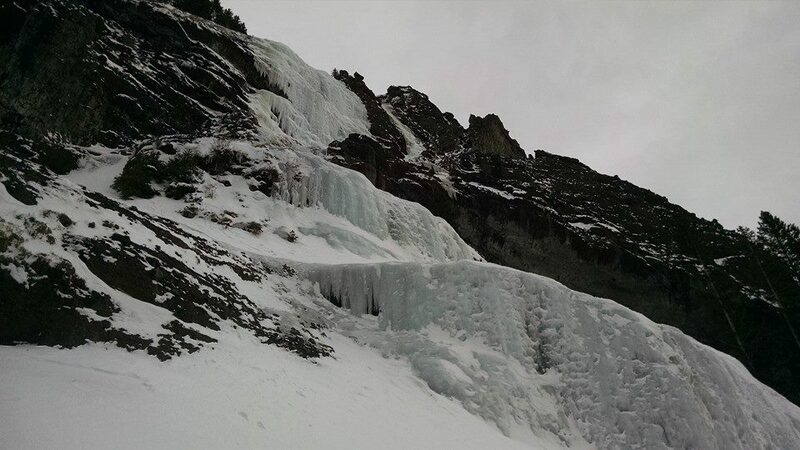 This was one of the first ice routes to be climbed in the area during the 1970's although with the improved crampon and ice tool technology, this climb is now a moderate classic. 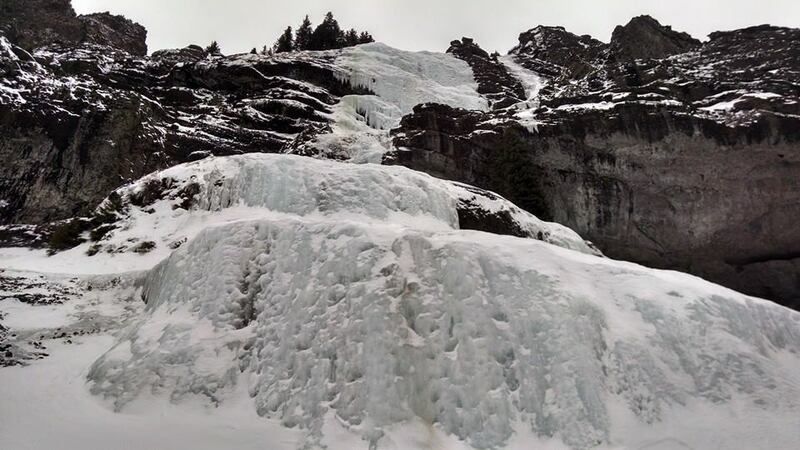 This waterfall is quite large so it's best climbed after a significant cold spell. From Red Lodge, drive north out of town on MT 78 and go 20 miles to Roscoe. Continue past Roscoe and go another 12 miles to the intersection with County Road 419 (towards Fishtail). Turn left (west) here and pass through Fishtail after 4 miles and continue all the way to the Stillwater Mine passing the Montana Jacks Bar and the town of Nye along the way. The mine will be on the right and about a half-mile further, just before the trailhead and the end of the road, is a turn-off to the left for the Woodbine Campground. Turn here and park at the gate since the campground is closed in winter. Hike through the campground to the highest loop towards the left side and look for a foot bridge. This marks the start of the trail. Cross the bridge and hike 20-25 minutes along the mellow trail until you reach a deep chasm where the falls come into view. You cannot miss it! Descend 50 feet to the stream below and put the crampons on here. The climb begins by hiking a couple minutes up the frozen stream and reaching the base of the long, but low angled first pitch. When fat, this 45 meter pitch is no harder than WI 2 and doesn't exceed 65 degrees. Of course, harder lines can be found towards the right side of the wide flow. There is a large tree to belay from atop the first pitch. A few minute hike gets you to the base of the WI 1+ second pitch which is usually soloed and only 15 meters high. Just above the second pitch is a large pool of water that must be hiked around on the left side to a large tree. 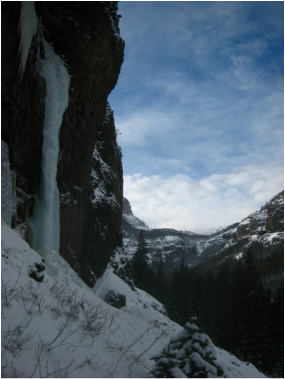 The third pitch is a steep but short WI 3+ step that rarely forms. 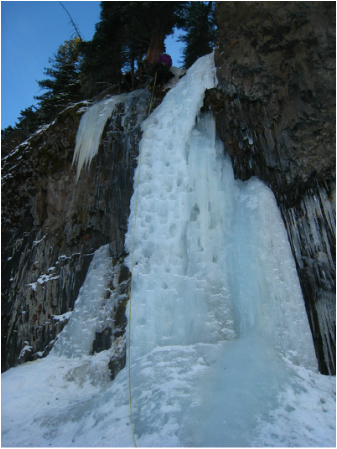 If it's formed, it makes for a beautiful 15 meter pitch of near vertical but very featured ice! Descend by walking off to the left and heading down the forested slope above the canyon where you'll meet the trail again. This was the second route Jacob and I did on our December 2013 trip. 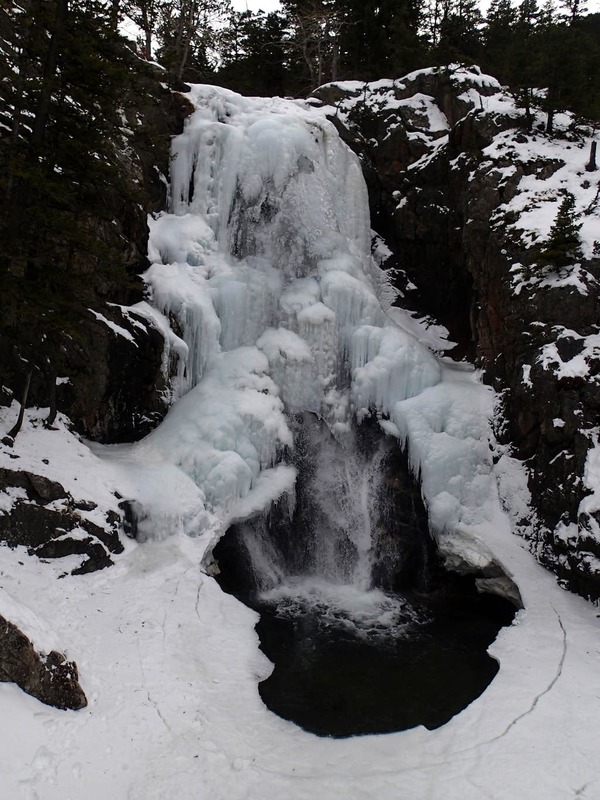 This flow has an incredibly short approach and situated on a small cliff band close to the East Rosebud Road. Go a half-mile past the start of the pavement upon entering the national forest, and park at a nice pull-out along the right side of the road just before a large beaver pond directly below the route. Walk up the small drainage for 15 minutes to the base. There are a number of options, all single pitch but the easiest line is on the right side offering nice climbing. Further left the ice is vertical offering one true WI 5 line. There is a tree at the top of the route you can use to set up a toprope on. You can also walk around and up to the right to reach the top without having to lead making this a perfect place to take friends and beginners.